Hello! Better start with the greetings as early as today. hehehe Aren't we excited? I know I am. So before we proceed with the decorating, checking lists, shopping, and wrapping, let me review the books I've read last November. The Naturals by Jennifer Lynn Barnes - my favorite YA mystery/ thriller/ crime story of the year. Harry Potter and the Sorcerer's Stone by JK Rowling - our TFG F2F book of the month. Alex Cross, Run by James Patterson - I miss Alex Cross and this one is long overdue. Besides these two, I still have Hunted by Elizabeth Heiter and A Feast Of Crows over-spilling from November. Here's hoping to finish all these even with the events and holiday celebrations looming near. 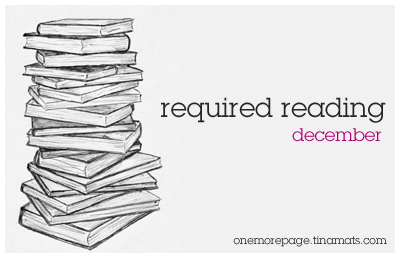 How about you guys, what books have you chosen for the most wonderful month of the year? Yes, definitely no bad vibes for the holidays! Yes Tin, HP is a reread. I am still debating if I am going to have it on audio this time. What do you suggest?